I've added some more M24 Chaffee photos, this one being at the Ropkey Museum in Indiana. As it happens, I'm working on bringing the old Italeri kit back to life. I build and review Dragon's Armored 1/4ton 4x4 Truck w/.50cal Machine Gun. I also review MiniArt's recent Close Combat U.S. Tank Crew and U.S. Tank Crew figure sets. October's the 10th anniversary of the website, so I've given myself a celebratory month off! I'm continuing to bolster the photo albums this month, with shots of an M7B1 Priest from Matt Riesmeyer, and an M24 Chaffee that I photographed last spring at the First Division Museum. I've had a chance to work on my photos from my spring AMPS trip and offer extensive walk-arounds of an early M5 Stuart and a very late M4A3E8 105mm Sherman photographed in Indiana. From Ft. Leonard Wood, MO, we have photos of a POA-CWS-H1 Sherman Flame Tank, kindly provided by Matt Riesmeyer. And closer to home, I shot an unusual M4A3 initial production Sherman at Waconia, MN. 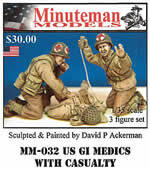 Minuteman Models has produced a nice pair of U.S. G.I. Medics with Casualty that will look fine as part of a larger diorama or one its own as a vignette. AFV Club graciously provided me with its new LVT-4 Late Type Water Buffalo and you can read and see how nicely it builds up into an accurate model of this important puddle jumper. I'm in the midst of painting and weathering but wanted to share the build experience. The 2012 AMPS show is now history. It was great to return to Auburn and see old friends, meet new people, and enjoy some great work on the tables. Enjoy my photos of US AFV models and check later for photos from the Ropkey Museum and tank hunting on the road. I've been pushing to get some projects done for the AMPS show starting April 27, so I haven't had much time to update the site. I have, however, posted a video on YouTube that I shot at the Fort Snelling Expo a couple years back of a US weapons demo. I hope you enjoy it. New World Minatures closed recently, an unfortunately loss and a good example of why I have a hard time resisting making purchases from aftermarket companies even if I don't have an immediate use for the product. You just never know if they'll be around when you need them. I highly recommend U.S. Soldiers Eating. January  Happy New Year! Greetings and salutations. Anyone up for some News Year resolutions? I'll go out on a limb again and state my goal is to finish more shelf queens this year. Last year I enjoyed a foray into some new areas (modern U.S. and Iraqi and WWII Russian) and it's refreshed my appreciation for good old olive drab.In the meantime, I've kept the products updated on the site and acquired a few items for review, including MiniArt's welcome U.S. 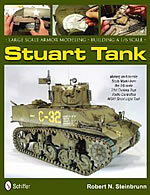 Tank Crew NW Europe and Robert Steinbrunn's pictorial account of his magnificent Building a 1/6 Scale Stuart Tank, published by Schiffer. Bob's step-by-step account of his transformation of this toy is nearly as impressive as the tank itself. And Ed Hall shares his list of drill sizes for MV Lenses.